Sterrett poses at Palmyra flanked by victories. SSID 12513407. John Robert Sitlington Sterrett (1851-1914) was appointed Professor of Greek at Cornell in 1901. During the previous decades he had traveled throughout Greece, Turkey, Syria, and Iraq, studying the inscriptions, monuments, and historical geography of the region. Upon his arrival at Cornell he communicated his love of archaeological exploration to three students who, in 1907-8, undertook the "Cornell Expedition to Asia Minor and the Assyro-Babylonian Orient." 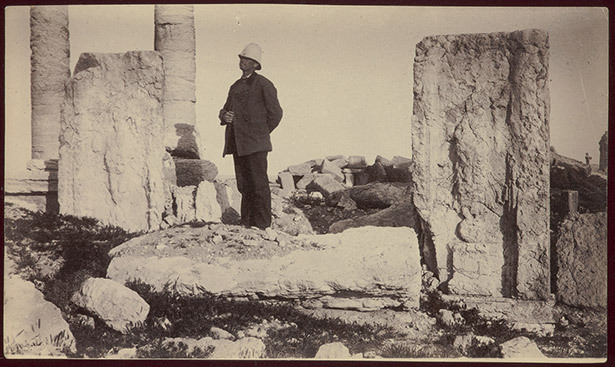 In 1918, Sterrett's widow gave his collection of archaeological photographs to the Cornell University Library, including hundreds of images taken by Sterrett's frequent companion in his travels, the pioneering archaeological photographer John Henry Haynes (1849-1910). The Sterrett collection also preserves photographs made by the Cornell Expedition of 1907-8. A DCAPS grant for 2015-16 funded digitization and study of the Sterrett collection, a portion of which is presented here. Study of the collection is ongoing; inquiries and comments are welcome. Acknowledgments: The objects from the Sterrett collection were photographed by Rhea Garen, and catalogued by Natasha Bissonauth, Ph.D. candidate in History of Art and Visual Studies. We wish especially to thank Robert Ousterhout, Professor of History of Art at the University of Pennsylvania, for encouragement and manifold assistance.